Learning to fly a radio-controlled plane is one of the first things novice hobbyists should learn. When you aim to fly the biggest rc plane in the future, of course you have to start with a small one. A small basic RC plane can help you learn the fundamentals so you move on to the expensive and larger ones later. There are different kinds of radio-controlled aircrafts, also called RC planes, which attract many hobbyists. For beginners, park flyers and trainers are suitable for them. For the more advanced pilots, they will enjoy the electric-powered sailplane aircraft with a glow-plug engine. The expert flyers would love the high-end competition aircrafts such as jets, helicopters, pylon racers, 3D aircrafts, and autogyros, which can provide satisfactory challenge. Some RC models available look and operate like birds, which can actually fly by flapping their wings. Most radio-controlled planes, including the biggest RC plane, can typically function through a handheld transmitter and a receiver within the plane. The receiver controls the servos that shift the surfaces based on the joysticks’ position on the transmitter. This in turn influences the orientation of the plane. Because of the arrival of more powerful motors, lighter batteries and cheaper radio system, flying RC planes has become more popular worldwide. These planes are not just for hobbyists; the government, military and scientific organizations also use them for experiments, aerodynamic modeling and testing, and weather readings. Some even use them as spy planes. The earliest kinds of electronically-guided model airplanes were hydrogen-filled models during the late 19th century. These crafts were operated as a music hall performance around theater auditoriums using a basic type of spark-emitted radio signal. Today, RC planes come in all designs, types and sizes. Quite a number of sophisticated toy RC aircrafts, helicopters, and ornithopters have been created. The RC kits require diverse amounts of assembly, costs and levels of skill and experience. Owners and hobbyists compete to own the most sophisticated and efficient RC crafts. They also compete in terms of aircraft size. 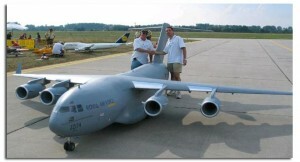 Many claim to own the biggest RC plane in the world. In fact, when you search the Internet, you will be flooded with videos priced RC planes, tagged as the biggest or the greatest. According to the Guinness Book of Records, however, the biggest RC plane is the B29 Dina Might from Belgium. It has a wingspan of almost 30 feet, weighs 463 pounds and runs off through four 160cc engines. 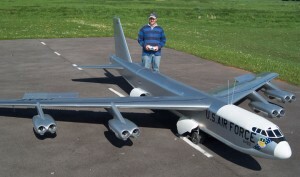 If you’re looking for a hobby, you may want to try the RC plane aviation and you might just beat the B29 Dina Might as the world’s biggest RC plane.